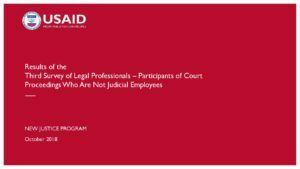 Results of USAID New Justice Program 2018 survey of legal professionals – participants of court proceedings who are not judicial employees. This survey aims to contribute to achieving Program Expected Results, primarily those related to judicial independence and accountability, combating corruption, administration of justice and access to justice by generating comprehensive findings for developing recommendations to GOU and civil society partners. The survey also supports New Justice monitoring and evaluation processes, especially related to measuring complex changes occurring in the justice sector regarding judicial independence and accountability, combating corruption, administration of justice, access to justice and public trust and confidence in the judiciary. 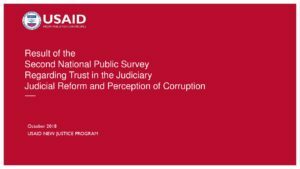 Results of USAID New Justice Program 2018 national public survey regarding trust in the judiciary, judicial reform and perception of corruption. This survey aims to contribute to achieving Program Expected Results, primarily those related to judicial independence and accountability, combatting corruption, administration of justice and access to justice by generating comprehensive findings for developing recommendations to GOU and civil society partners. 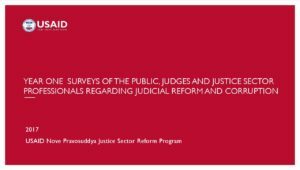 The survey also supports New Justice monitoring and evaluation processes, especially related to measuring complex changes occurring in the justice sector regarding judicial independence and accountability, combatting corruption, administration of justice, access to justice and public trust and confidence in the judiciary. 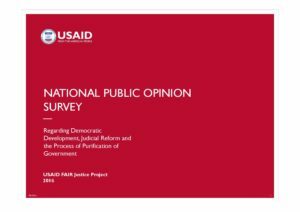 Results of USAID New Justice Program (New Justice) 2017 national surveys of the public, judges and justice sector professionals regarding judicial reform, public trust in the judiciary, judicial independence and accountability, perception of corruption. These surveys aim to contribute to achieving Program Expected Results, primarily those related to judicial independence and accountability, combatting corruption, administration of justice and access to justice by generating comprehensive findings for developing recommendations to GOU and civil society partners. Surveys also support New Justice monitoring and evaluation processes, especially related to measuring complex changes occurring in the justice sector regarding judicial independence and accountability, combatting corruption, administration of justice, access to justice and public trust and confidence in the judiciary. This presentation provides summarized results of the survey of judges regarding the judicial reform in Ukraine and implementation of laws of Ukraine “On the Restoration of Trust in the Judiciary”, “On Purification of Government” and “On Ensuring the Right to Fair Trial”, in particular, gender balance, age structure and professional experience of judges are analyzed, conditions of work are characterized. Considerable attention is paid to the topic of the judicial reform in Ukraine in the part of judicial perception of the conditions of work, attitude to vetting and lustration procedures as well as novelties of the legislation on the judiciary. 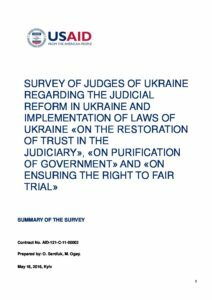 This document provides summarized results of the survey of judges regarding the judicial reform in Ukraine and implementation of laws of Ukraine “On the Restoration of Trust in the Judiciary”, “On Purification of Government” and “On Ensuring the Right to Fair Trial”, in particular, gender balance, age structure and professional experience of judges are analyzed, conditions of work are characterized. Considerable attention is paid to the topic of the judicial reform in Ukraine in the part of judicial perception of the conditions of work, attitude to vetting and lustration procedures as well as novelties of the legislation on the judiciary. On the basis of the results of the survey summarized conclusions and recommendations are made. 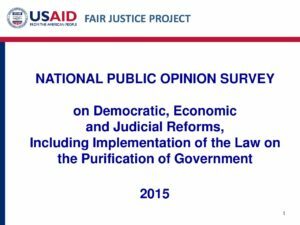 Presentation includes results of the second National Public Opinion Survey on Democratic Development, Judicial Reform and the Purification of Government. 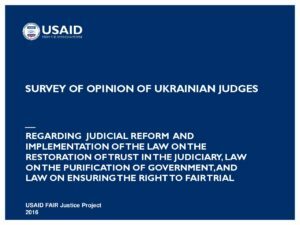 USAID FAIR Justice Project and GfK Ukraine conducted this survey in May and June 2016 to measure public opinion regarding the level satisfaction with the government’s response to public demands following the Revolution of Dignity, general trends in the level of trust in government and the judiciary, as well as the level of awareness and support for processes related to the lustration and vetting of public officials and judges. This document presents summarized results of the 2016 public opinion poll as well as the comparative analysis with the 2015 survey data in the following areas: regarding the public perception of political and socio-economic processes, in particular, the level of awareness of Ukrainian citizens, their understanding of the essence and content of the purification of government process, and perception of the categories of officials subject to lustration. Considerable attention was devoted to implementing the process of purification of the judiciary, social and socio-demographic evaluation of respondents groups was provided dependent on respondents’ position in perceiving lustration. Based on the survey results the conclusions and recommendations were developed. 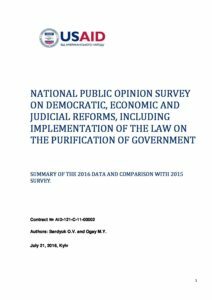 National Public Opinion Survey on Democratic, Economic and Judicial Reforms, Including Implementation of the Law on the Purification of Government.